Althaf's Journal: How to remember of relationships exponent, log and root ? There is a common relation between exponent, log and root, to know more about the intuition between these relation refer here. 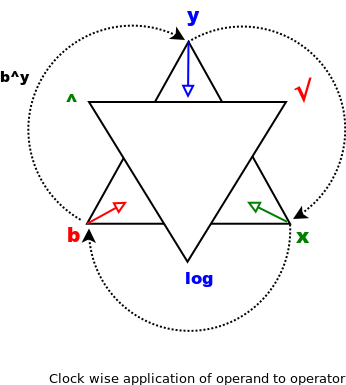 A simple trick to have all these relation derived is by just imagining this star. This is meant for people with dyslexia, usually they get confused about these relation. Since we are really good with photo memory, this approach will help deduce these relations even in mind. Focus at the unknown variable of the context from the vertex of bottom triangle. 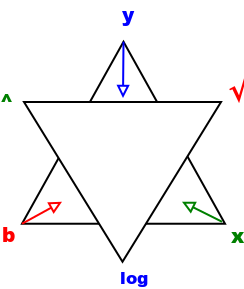 Follow the arrow at the the vertex of variable to the operator pointed by the arrow. Apply the operation, while taking the operands in the clock wise order.